Just one race today, the second stage of the Presidential Tour of Turkey. Tomorrow, the 28th, will be the first stage of the Tour of Romandie. We had four big races on Sunday, so it's no surprise my in-box had more than a few reports from the teams. We'll start with the big dog first, Liège-Bastogne-Liège. The Lotto Soudal riders didn’t set a top result in Liège-Bastogne-Liège. In the descent of the Côte de Stockeu, at about 75 kilometres from the finish, Tim Wellens had a puncture. Teammate Louis Vervaeke gave him his wheel. It took a while before Wellens could return to the peloton, because at the Haute-Levée the peloton had fallen apart. Wellens was dropped later on the Roche-aux-Faucons because he had lost too much energy. Jelle Vanendert and Tony Gallopin were distanced on the Saint-Nicolas, with top at 5.5 kilometres from the finish. A group of twelve riders got in front. Alejandro Valverde won, ahead of Julian Alaphilippe and Joaquim Rodríguez. Tony Gallopin was 20th at 58” and Jelle Vanendert 22nd at 1’04”. Lotto Soudal manager Marc Sergeant analyses the race. “On the Rosier, Maquisard and La Redoute Jelle and Tony rode in the first part of the peloton. When the race exploded Jelle couldn’t react due to his crashes in the Amstel and Flèche Wallonne. When there were attacks on the Roche-aux-Faucons Tony couldn’t follow either. Strong teams were represented, we should have had a man in the break as well, that was a bad sign. Before Saint-Nicolas it all came back together, but Tony was too far behind to follow the best." Before the race Lotto-Soudal riders checked out the course. Wilco Kelderman’s efforts failed to get him a top result in the Liège-Bastogne-Liège today in Belgium, but he still came away from his debut in the last spring classic of the season with a 37th place. The Dutchman finished one minute and 41 seconds behind winner, Spaniard Alejandro Valverde of team Movistar. Paul Martens went down hard with 40 kilometres remaining along with a dozen other riders, including his teammates Bert-Jan Lindeman and Bram Tankink. Tankink suffered a minor concussion. Martens finished the race with a broken metacarpal bone in his left hand. 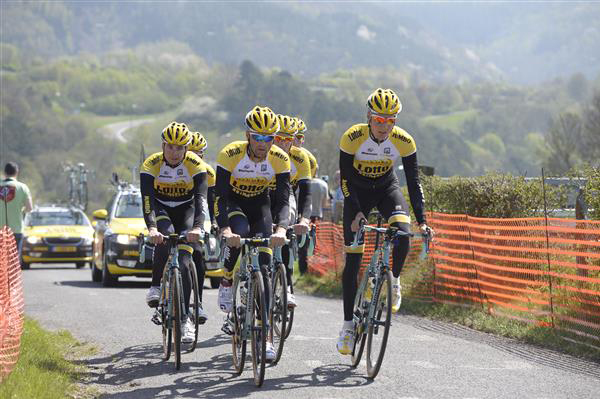 And here LottoNL-Jumbo riders check out the course a couple of days before the race. Kelderman placed 10th in La Flèche Wallonne on Wednesday. Tinkoff-Saxo’s Roman Kreuziger took matters into his own hands with a powerful move on Côte de la Roche-aux-Faucons with 19.3km to go. After being caught on the last marked climb, Kreuziger hung tight to claim a fifth place behind race winner Alejandro Valverde in Liège-Bastogne-Liège. Following the finish, Tinkoff-Saxo sports director Sean Yates noted he was impressed by the strength of his Czech captain during the course of the race. “Roman undoubtedly proved that he’s a strong rider and that Liège-Bastogne-Liège suits him. His attack on Côte de la Roche-aux-Faucons put a lot of his rivals into the hurt-zone and hadn’t it been for Stybar sacrificing himself in the decimated group of favorites, the front trio with Roman could arguably have survived. However with that said, I believe we rode a proper race against some very strong opponents, who we knew would be hard to beat in a sprint for the line”, says Sean Yates. Going into the race finale, after the steepest of the climbs Côte de Stockeu, Tinkoff-Saxo had six riders in the decimating peloton from where, among others, Manuele Boaro went on the attack. When asked to evaluate the team performance, Sean Yates states that he’s pleased to see a mounting shape among his riders. “I think that we are much better shape-wise than some weeks ago. Roman was one of the strongest today and Kiserlovski was 18th and shows definite signs of improvement, while guys like Chris Anker, Majka and Boaro put in a good team effort. In general, I believe we are on the up and several of the guys continue to Tour de Romandie, where I hope they will continue in a strong fashion”, commented Sean Yates. Liège-Bastogne-Liège was marked by 253km and an elevation gain of more than 4,000m. Going into the iconic Côte de la Redoute with 36km to go to the finish line in Ans, Tinkoff-Saxo was in the mix with several teammates left to protect Kreuziger. One of them was Robert Kiserlovski, who ultimately finished 18th, 44 seconds down on race winner Alejandro Valverde (Movistar). According to Kiserlovski, his sensations have improved since the start of the Ardennes Classics. “I felt pretty well today. Of course it’s a very hard race, one of the hardest classics but my condition has improved leading up to and during the Ardennes Classics. This is something I’m really happy with, as I was struggling to reach my normal level earlier in the season. I could sense that I had the legs to support Roman on La Redoute and on Roche-aux-Faucons, while I had to let go on Saint-Nicolas as the favorites attacked”, says Kiserlovski and adds: “Today, Roman was our absolute leader and we also saw in the finale that he was going really well. Now, many of us continue to Romandie, where I want to continue building my shape, while delivering a good result for the team and doing my best for our common objectives”. Alejandro Valverde beat Julian Alaphilippe (Etixx-Quickstep) and Joaquim Rodriguez (Katusha) in a last sprint for the podium places, while Rui Costa (Lampre-Merida) finished fourth just in front of Roman Kreuziger. As predicted, stage 1 of Tour of Turkey came down to a bunch sprint decision, where Tinkoff-Saxo’s Michael Kolar finished sixth behind stage winner Mark Cavendish. The final burst for the line came after an extended, high-speed run in into Alanya, where a hectic fight for positioning took place. Following the stage finish, Tinkoff-Saxo DS Nicki Sørensen declares himself satisfied with the team performance. “I was very happy with the team's commitment and the way the riders executed the game plan. 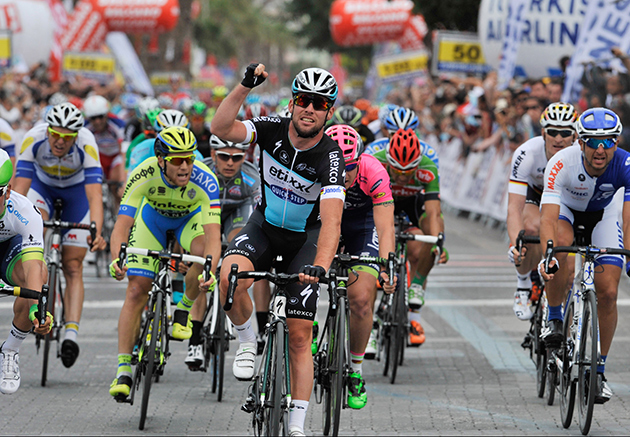 For me that's the most important aspect from the opening stage of the 2015 Tour of Turkey. We had a good group and sixth place is a good result to start the race”, says Nicki Sørensen, who notes that team sprinter Michael Kolar has found the legs ahead of the coming sprinter’s duels. “More importantly, Michael Kolar was in good shape and he feels he has more to give in the following days. That's also a good sign for the following days and I have to admit I'm happy with the guys”. Stage 1 took the peloton on a 145-kilometer parcours on mostly flat roads starting and finishing in the seaside town of Alanya. Leading into the final kilometers, Tinkoff-Saxo positioned most of the team at the front of the speeding pack in order to set up Michael Kolar. Nicki Sørensen asserts that the sprint decision didn’t come as a surprise. “It was written all over this was going to be a sprinter's stage and that's exactly the way it played out. We knew about it, we had planned about it and the key point of the stage was going to be the absolute final stretch”, finishes the team sports director ahead of a slightly more undulating day on stage 2. 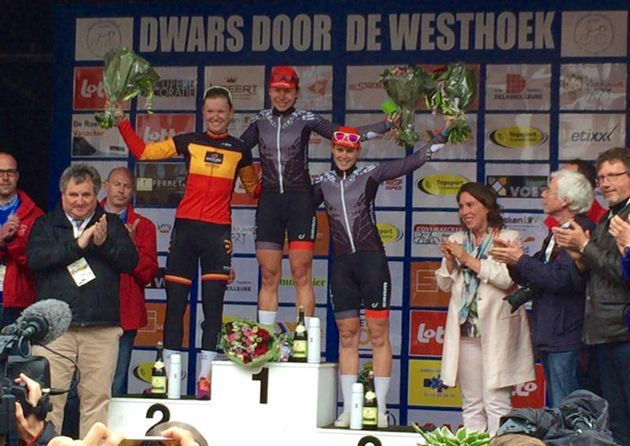 Boezinge, Belgium, 26 April 2015 - Velocio-SRAM's Elise Delzenne has crossed the line alone to win UCI 1.1 Dwars door de Westhoek in Belgium today. Delzenne timed an attack perfectly with around 44 kilometres to race and was never caught by the bunch, winning with over 30 seconds to spare. In the sprint to the line, team mate Tiffany Cromwell sprinted to a third place. Dwars door de Westhoek is raced around the Belgian town of Boezinge with a large lap including a few small climbs before finishing with four small town circuits. The race was aggressive with the early climbs splitting the bunch into several small groups although later coming back together to form a large main peloton. Delzenne attacked after the first sprint as the peloton crossed the finish line for the first intermediate sprint, and with four circuits to race. In a brave move with still 44 kilometres to race, the lead for Delzenne fluctuated between 30 seconds and 1 minute 10 seconds for the Velocio-SRAM rider. The other teams were unable to bring her lead back and Delzenne went to the line to take out the biggest win of her career, and her first big win since signing for Velocio-SRAM at the start of 2014. Delzenne said, "I'm so happy to win and my first real victory! I didn't really expect that I would be winning today before the race. I just thought that at that moment that I attacked it was good timing because the race had been aggressive early and directly after the intermediate sprint I saw an opportunity. My team mates raced well in the first part of the race and I'm sure they were helping control it when I was away solo. I'm very pleased." Team Director Sportif Ronny Lauke was very pleased with all of the efforts of the team. "The girls raced fantastic together today and it's a great result not only for Elise but for the team. Since taking a break following Track World Championships in February Elise has only just returned to racing with the team in the last ten days. She was instrumental in helping Barbara Guarischi sprint to a third place in Ronde van Gelderland last weekend and after her win today it's obvious she is in strong early form. 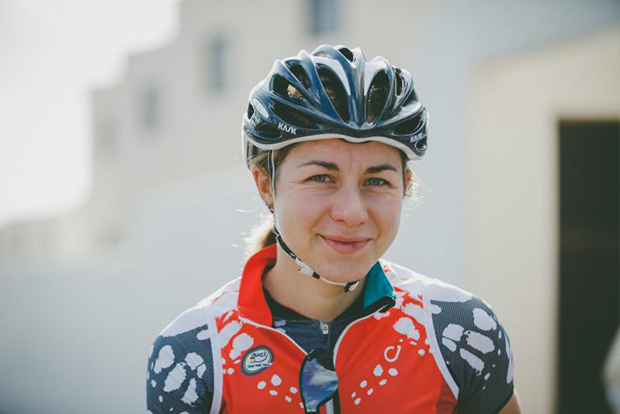 The team will next race the Gracia Orlova stage race in Czech Republic starting 30 April, 2015.